There's already plenty of angst out there about the prospect of jobs lost to artificial intelligence, but this week, artists got a fresh reason to be concerned. A new "Rembrandt" painting unveiled in Amsterdam is not the work of the Dutch master Rembrandt van Rijn at all, but rather the creation of a combination of technologies including facial recognition, AI, and 3D printing. Essentially, a deep-learning algorithm was trained on Rembrandt's 346 known paintings and then asked to produce a brand-new one replicating the artist's subject matter and style. Dubbed "The Next Rembrandt," the result is a portrait of a caucasian male, and it looks uncannily like the real thing. 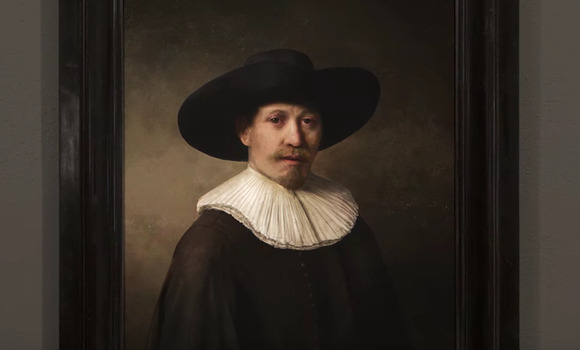 From there, the algorithm began to analyze specific facial features matching that profile with the aim of creating a "typical" Rembrandt eye, nose, mouth, and ear, for example. Also considered were the facial proportions, or the distances separating those features.